The country is reeling under 14 hours of power cuts, that are expected to spike up to 21 hours in the coming months. Load shedding along with the never ending political bickering continues to cripple the country’s economy and everyday life. 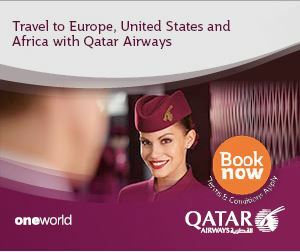 People are now desperately looking for alternatives to the expensive fuel guzzling generators. Ujyaalo radio 90 network (ujyaaloonline.com), a nationwide news service provider to 150 local stations across the country, is among the few enterprises to have made the switch to solar power as an answer to the catastrophic power shortage. Aptly named Ujyaalo Ghar (Bright home), the four-story building is powered by 10 KW solar panels which caters to the energy needs of its 60 employees, enabling round the clock media production for both radio and internet. “Going solar had been our long overdue plan since we moved to our new building and the switch has finally given us the much needed stable electricity,” says Gopal Guragain, director of Ujyaalo, of the month old hybrid solar system. 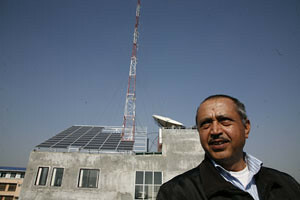 Sunny Side Up: Gopal Guragain of Ujyaalo network no longer worries about power cuts, thanks to solar power. 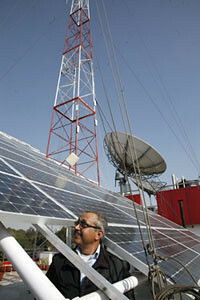 Although some FM stations in Jumla and Bajura do run on solar power, their scale isn’t as large as Ujyaalo’s. The 55 solar panels on the spacious terrace give Ujyaalo Ghar a unique look in the quiet neighborhood of Jawlakhel. Although it spent close to 2.5 million rupees on the installation, Gopal Guragain is confident of recovering the cost in a few years. “We used to spend around a million rupees annually just on fuel for the generator, and during shortages the cost further increased,” says Guragain. He adds that the monthly electricity bill has already been cut by half and is certain that the initial cost will be recovered soon. The hassle free solar panels have also saved them the time and effort that went into the maintenance of diesel generators. According to Guragain, Ujyaalo Ghar was designed with sustainable use of energy in mind. The building is not just solar powered but also harnesses rain water to replenish ground water. “We want to be as energy efficient as possible,” he says. With ample sunshine this winter,things have been good so far for the new converts to solar power. “Even on cloudy days, enough power is generated to last us throughout the day,” says Guragain, who is more than happy about the hassle free solar panels that will last for the next 15-20 years. “The initial investment might be high, but the returns far outweigh the cost,” he says. 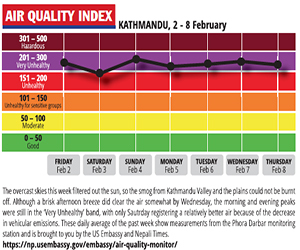 Kathmandu has become a city that sleeps before nine at night. The streets are practically deserted as dusk sets in, and thanks to load shedding, the street lights render no help. However in the past few months major intersections of the city have become dotted with new solar powered bus stops that lights up the city even during the pitch dark hours of load shedding. It is the brainchild of Shine Exhibits, an infrastructure development company, that set up these bus stops with 180-watt solar panels with a six-volt battery and LED lights. “Many companies are now eager to advertise in these bus stops which has assisted the public during night travel,” says Harish Agarwal of Shine Exhibits. The company has already set up 15 such solar powered bus stops, and plans to add more in the next few months. The revenue generated from these bus stops goes back into their maintenance. "We can't risk our lives, can we?"